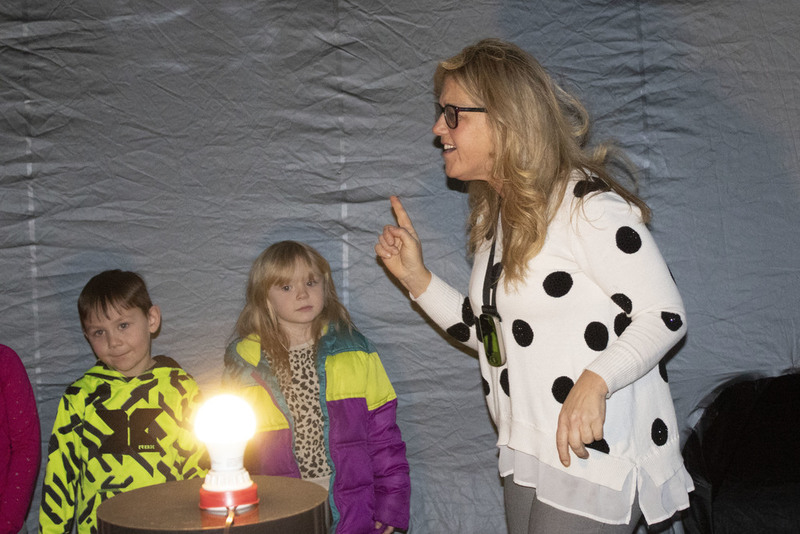 The students at Alliance Early Learning School had quite the treat the when the Star Lab visiting the school. 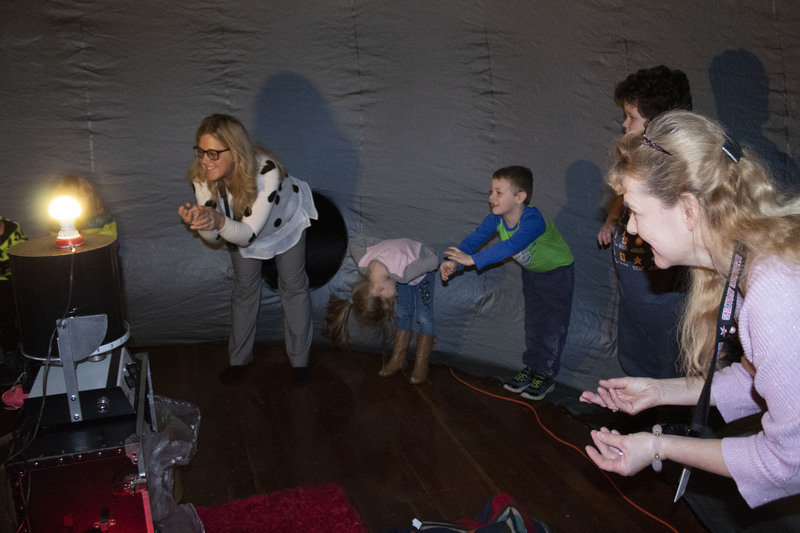 Each preschool and kindergarten classroom had the chance to visit the portable planetarium to learn about the stars and the solar system. The portable dome, which looked like a black igloo sitting on the stage at AELS, housed a whole class of students at one time. The students crawled through a tunnel which led to a large open space with enough room for a whole class of students. In the center of the dome was a light which represented the sun. The students discussed how the earth rotates around the sun and the difference between daytime and nighttime relative to the Earth’s rotation. Tracy Bowser, designed the program for the students. While the Star Lab is able to be used by all grade levels, there are no programs designed for students in kindergarten and first grade. Bowser came up with the program, thinking about what would be interesting for the students and easiest for them to understand. The program lasted about 30 minutes and let the students see how the position of the stars can change based on the position of the earth. To teach the students about day going to night time, Bowser slowly turned off the lights in the dome and told the students to whisper when they saw a star. She explained that the stars are always in the sky, they just can’t be seen due to the light from the sun. As the students’ eyes acclimated to the darkness, they whispered “there’s a star” and “I see a star” every time they saw a new one appear before their eyes. Because light interferes with a person’s ability to see stars, the dome has to be kept entirely dark during the duration of the program to allow the students to see all they are meant to. The students learned about some of the constellations, including the Big Dipper, Little Dipper and Orion. They even learned how to tell their position and how to find locations based off of where the stars are in the sky. In order to learn, they listened to the songs about the stars and solar systems. The Star Lab is loaned to local schools by R.G. Drage Career Technical Center in Massillon, who delivers it to the schools. Any school in Stark County can borrow the Star Lab for free, so long as a person is trained on how to use it. Bowser took an eight-hour training class to learn how to set up the lab and to use the equipment. AELS places the Star Lab on the stage, a process that takes about half an hour. It takes a little longer to tear it down and put it away since the lab has to deflate and be folded to fit into a bag. This won’t be the students only experience with a planetarium this year. At the end of the school year, the students will visit the McKinley Museum where they will view an actual planetarium. The Star Lab helps the students to understand concepts that are sometimes difficult to understand by giving them an up close look at the solar system while also having fun at the same time.